Posted on January 28, 2013 January 29, 2013 by Marlene Hoenig - You are one of God's Treasures! Not EVERYONE requires exactly eight 8-ounce glasses of water every day. The Institute of Medicine has determined that an adequate intake (AI) for men is roughly 3 liters (about 13 cups) of total beverages a day. The AI for women is 2.2 liters (about 9 cups) of total beverages a day. So the traditional rule should really be stated as: “Drink at least eight 8-ounce glasses of fluid a day,” because all fluids count toward your daily total. But there’s no doubt that drinking WATER is important to our overall health and well-being. Water helps to flush toxins and waste products from our bodies. 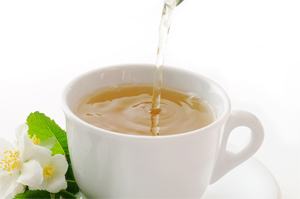 It aids our digestion and “keep us regular”. Drinking water prevents dehydration, and It helps us look better too. Water is proven to help with weight loss and helps hydrates the skin which in turn reduces the signs of aging. There is no denying that your body feels happier and healthier when you consume enough water. So how do we go about getting enough each day? If I knew EXACTLY how that could be accomplished I could write a book, it would become a best seller and I would become a gazillionaire! Since I don’t know EXACTLY how it’s done (because to be quite honest I really am BAD at it!) here are 23 ideas from your fellow readers for your consideration. I personally am going to try them all! 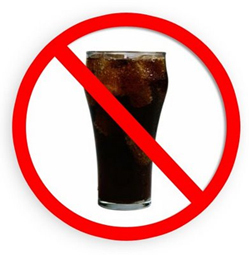 don’t allow yourself a diet soda until you’ve had two to four glasses of water. Eventually you will find that you won’t crave the soda as much. Have a big glass of water at every transitional point of the day: when you first get up, just before leaving the house, when you sit down to work, etc. Make it convenient – keep a big, insulated water bottle full on your desk and reach for it all day. Down a full glass several times a day. Go over to your kitchen right now and fill up a glass. No sipping over time. Just drink it down right after you fill it up. Track it. Make a chart and tick it off each time you drink a glass. 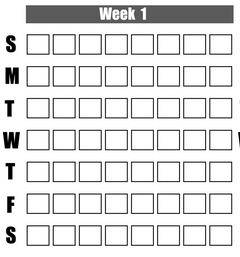 Do a chart for 30 days and you will have made drinking water a part of your routine. Have one glass every hour on the hour while at work or school. When the work/school day is done, your water quota is met. 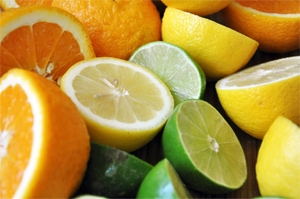 Freeze peeled pieces of lemons, limes, and oranges and use them instead of ice cubes – it’s refreshing and helps get in a serving or two of fruit. After each trip to the restroom, guzzle an eight-ounce glass to replenish your system. Set a goal to drink X amount of water a day, then write it down along with your reasons WHY! Remembering your motivation will help you keep going when enthusiasm fades. Fizz it up! Get a home seltzer maker like a Soda Stream and make your own fizzy H2O! Add a dash of lemon or a splash of O.J. and you’ll have a super refreshing drink! Fill up a large cup with crushed ice or ice cubes and snack on them (like candy!) throughout the day. Make a bet with a co-worker to see who can drink more water in the course of a day. 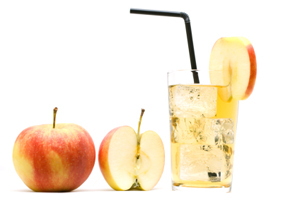 When drinking juice (apple, grape, or orange) fill half the glass with water or ice and make sure to consume all of it. Bring a two-liter bottle of water to work and try to drink it all before you leave work. If you don’t finish, drink it in traffic on the way home – it’s like a race. Keep a large cup full of ice at your desk and keep re-filling it with water. 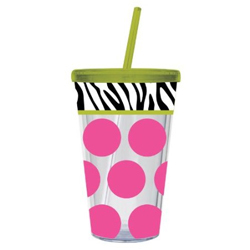 The key is drinking with a straw – you take bigger gulps and drink more at a time. Here’s a tip if you’re trying to shed some pounds: Let ounces of water double grams of fat: when eating something containing 10 grams of fat, drink 20 ounces of water. Drink two full glasses at each meal, one before and one after. Also, drink one glass before each snack so you don’t eat as much. 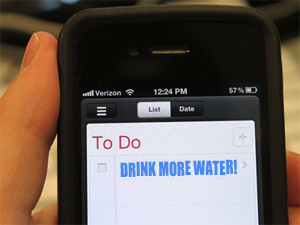 Put reminders into your phone or calendar to drink at regular intervals. Surprisingly, this helps me a LOT! I know it sounds lame, but I just plain FORGET to drink water! Carry a small refillable water bottle at all times and drink during downtime; while waiting in a bank line, sitting on the train, etc. Not ALL your water has to be COLD…drink some of it HOT. Have a nice warm cup of tea instead. But be sure it’s decaf since caffeine actually robs you of water (it’s a diuretic). Always keep a bottle of water handy while watching TV, doing laundry, making dinner, etc. Add drinking two glasses of water to your daily skincare regimen. Drink, cleanse, moisturize, then drink again. If you’re like me, it might be necessary to use these ideas to TRICK yourself into doing something good for you….just until it (hopefully!) becomes a habit! Note: the amount of water that each person should drink daily depends on your physical health, the amount of exercise you do daily, whether you live in a hot or cold climate and other factors (such as pregnancy). 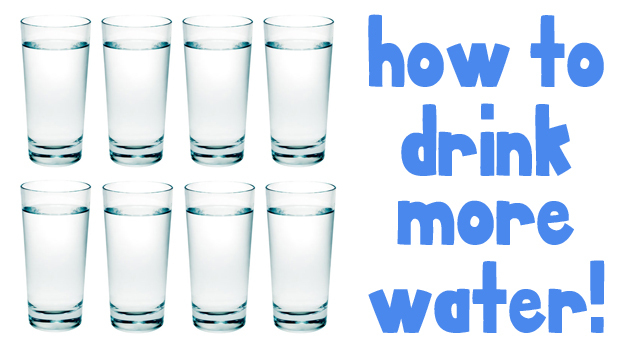 Please get advice from a medical professional to find out how much water you should drink daily.